A positive reception to the budget fails to move the needle on Essential Research’s voting intention reading. Also featured: a closer look at the budget response results from Newspoll. As reported by The Guardian, Essential Research has provided the third post-budget poll, and it concurs with Newspoll in having Labor leading 52-48, but in not in finding the Coalition’s improved, since 52-48 was where Essential already had it a fortnight ago. Both major parties are down a point, the Coalition to 38% and Labor to 35%, the Greens are up one to 11% and One Nation is down two to 5% – which means the residue is up fairly substantially, by three points to 10%. The poll also agrees with Newspoll and Ipsos in finding a positive response to the budget, which was rated favourably by 51% and unfavourably by 27%. Respondents were presented with a list of budget measures and asked yea or nay, with unsurprising responses: strongly positive for infrastructure spending, tax relief measures aimed at those on low and middle incomes and the projection of a surplus, but much weaker on flattening tax scales. Also featured was an occasional question on best party to handle various issues, which does not appear to have thrown up anything unusual. Full detail on that will become available when the full report is published later today. UPDATE: Full report from Essential Research here. The poll was conducted Thursday to Sunday from a sample of 1069. Backtracking a little to the weekend’s Newspoll numbers, I offer the following displays covering three of their measures in two charts, placing the results in the context of the post-budget polling that Newspoll has been conducting in consistent fashion since 1988. 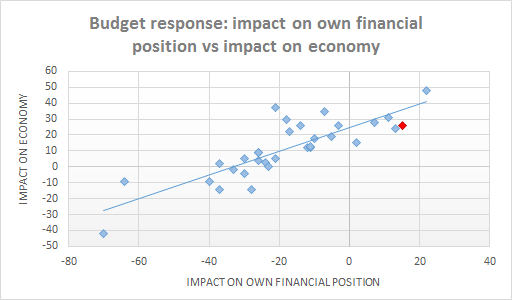 The first is a scatterplot for the questions on the budget’s anticipated impact on personal finances and the economy as a whole (net measures in both cases, so positive effect minus negative effect), with last week’s budget shown in red. Naturally enough, these measures are broadly correlated. However, respondents were, relatively speaking, less convinced about the budget’s economic impact than they normally would be of a budget rated so highly for its impact on personal finances. Nonetheless, the standout fact is that the budget was very well received overall – the personal finances response was the second highest ever recorded, and economic impact came equal seventh out of thirty-two. There are, however, two grounds on which Labor can take heart. First, the one occasion when the personal finances result surpassed this budget was in 2007, immediately before the last time the Coalition was evicted from office. 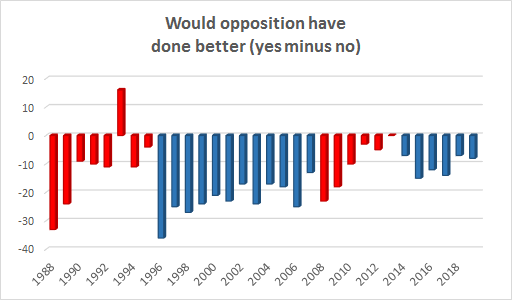 The second is provided by the question of whether the opposition would have done better, which if anything came slightly at the high end of average. For Labor to hold its ground here in the context of a budget that had a net rating of plus 25 on personal impact, compared with plus two last year, suggests voters have revised upwards their expectations of what Labor might do for them financially. Newspoll and Ipsos offer very mixed signals on the question of whether the government has enjoyed a rarely sighted “budget bounce”. Two post-budget polls are in – Newspoll from The Australian, Ipsos for Nine Newspapers – and they offer contrasting pictures as to whether support for the government has gone up or down in the wake of last week’s budget. Newspoll produces an encouraging result for the Coalition in showing Labor’s two-party lead at 52-48, rather than 54-46. Ordinarily I would point out that a two-point movement from Newspoll is a rare occurrence, which close observers of the polling industry suspect is down to Newspoll smoothing its numbers with some variety of rolling average, in which the results of the previous poll are combined with those of the latest. However, the last Newspoll was, very unusually, four weeks ago, the delay being down to the New South Wales election a fortnight ago and a desire to hold off until the budget last week. So it would not surprise me if things were different this time, and the result was drawn entirely from this week’s survey, which will have been conducted from Thursday to Sunday (UPDATE: as indeed it was, from a sample of 1799). The report currently up on The Australian’s website is a bit sketchy, but it tells us the Coalition is up two on the primary vote to 38% and Labor is down two to 37%, with One Nation down one to 6%. Scott Morrison’s approval rating is up three to 46% and Bill Shorten’s is up one to 37%, but there is no word yet on disapproval ratings, preferred prime minister, the Greens primary vote and the sample size. The report also rates the budget has scored the highest since the last Howard government budget in 2007 on impact on personal circumstances and cost of living. Stay tuned for further detail. UPDATE: The Greens primary vote is steady at 9%; Morrison is down two on disapproval to 43%; Shorten is steady on disapproval at 51%; Morrison’s lead as preferred prime minister is out from 43-36 to 46-35. The post-budget Ipsos poll for Nine Newspapers, which is the first since mid-February, records an actual deterioration for the Coalition on the last since last time, albeit that that was an anomalously strong result for the Coalition (the one that had The Australian proclaiming “Morrison’s Tampa moment” across its front page headline). The two-party headline in the poll is 53-47 in favour of Labor, compared with 51-49 last time, which I’m guessing applies to both respondent-allocated and two-party preferred preference measures since the reports don’t specify. Ipsos’s primary votes are as usual on the low side for the major parties and well on the high side for the Greens: the Coalition are down a point to 37%, Labor is steady on 34% and the Greens are steady on 13%. If it might be thought odd that such small primary vote movement should produce a two-point shift on two-party preferred, it would appear that rounding favoured the Coalition last time and Labor this time. On the budget, the poll finds 38% expecting they would be better off and 24% saying worse off, which is around the same as last year. Forty-one per cent thought it fair and 29% unfair. Leadership ratings are, as usual, more favourable from Ipsos than other pollsters, but otherwise notable in recording increased uncommitted ratings across the board. Scott Morrison records 48% approval and 38% disapproval, both down one from last time; Bill Shorten is is down four on approval to 36% and one on disapproval to 51%; and Morrison’s lead as preferred prime minister shifts from 48-38 to 46-35. Reports on the poll, possibly paywalled, can be found at the Sydney Morning Herald and the Financial Review. The poll was conducted Wednesday to Saturday from a sample of 1200.